The US President pledged on Wednesday in a speech given in the Estonian capital Tallinn that NATO would defend its Baltic allies against possible Russian threat. US President’s speech in full. Full transcript of Barack Obama’s speech, as provided by Federal News Service (www.fednews.com). To President Ilves and distinguished guests, to the people of Estonia, it is a great pleasure to be with you in this historic city, in this beautiful land. I thank you for the incredible hospitality that you’ve shown me today. I understand the weather is always like this. (Laughter.) My only regret is that I missed this summer’s — (in Estonian) — and I’ll try to come back next time and catch it. I bring with me the friendship of the American people, and I’m honored to be the first president of the United States to deliver an address like this to the people of Estonia. I just had the opportunity to meet once again with the presidents of all the Baltic states, and I thank — president of Latvia and Lithuania for being here. We are joined by friends from throughout the region. And I want to say a special welcome to everyone watching this out in Freedom Square. And I’m especially pleased to see so many young people here today, because like Oscar (ph), you are fulfilling the dream that your parents and grandparents struggled for but could only imagine, and that is living your lives in free and independent and democratic Baltic nations. That dream of freedom endured through centuries of occupation and oppression. It blossomed into independence, only to have it stolen by foreign pacts and secret protocols. It survived the mass deportations that ripped parents from their children. It was defended by Forest Brothers in the resistance, and sustained by poets and authors who kept alive your languages and cultures. And then exactly 25 years ago, people across the Baltics came together in one of the greatest displays of freedom and nonviolent resistance that the world has ever seen. On that August evening, perhaps 2 million people stepped out of their homes and joined hands — a human chain of freedom, the Baltic way — and they stretched down highways and across farmlands, from Tallinn to Riga to Vilnius. They lit candles and they sang anthems. Old men and women brought out their flags of independence, and young parents brought their children to teach them that when ordinary people stand together, great change is possible. Here in Estonia, when people joined the line, the password was “freedom.” As one man said that day, the Berlin Wall is made of brick and concrete. Our wall is stronger. And it was. Within months, that wall in Berlin was pushed open. The next year, the Baltic peoples finally voted in elections. And when the forces of the past made their last grab for power, you stood up. Lithuanians faced down tanks. Latvians manned barricades. Here in Tallinn, citizens rushed to the TV tower to defend the airwaves of democracy. You won. You reclaimed your countries. And in your new constitution you declared the independence and sovereignty of Estonia are timeless and inalienable. But the people of the Baltic nations also knew that freedom needs a foundation of security. So you reached out to join the NATO alliance. And we were proud to welcome you as new allies so that those words of your constitution, your timeless independence, will always be guaranteed by the strongest military alliance the world has ever known. Today, people working to build their own democracies to Kiev to Tunis look to you for inspiration. Your experience cautions that progress is neither easy nor quick. Here in the Baltics, after decades of authoritarian rule, the habits of democracy had to be learned. The institutions of good governance had to be built. Economies had to be reformed. Foreign forces had to be removed from your territory. And transitions of this magnitude are daunting for any nation. But the Baltics show the word what’s possible when free peoples come together for the change that they seek. And in that great contest of ideas between freedom and authoritarianism, between liberty and oppression, your success proves, like that human chain 25 years ago, that our way will always be stronger. We’re stronger because we’re democracies. We’re not afraid of free and fair elections because true legitimacy can only come from one source, and that is the people. We’re not afraid of an independent judiciary, because no one is above the law. We’re not afraid of a free press or vibrant debate or a strong civil society because leaders must be held accountable. We’re not afraid to let our young people go online to learn and discover and organise because we know that countries are more successful when citizens are free to think for themselves. We’re stronger because we embrace open economies. Look at the evidence. Here in Estonia, we see the success of free markets, integration with Europe, taking on tough reforms. You’ve become one of the most wired countries on Earth, a global leader in e-government and high-tech start-ups. The entrepreneurial spirit of the Estonian people has been unleashed. And your innovations, like Skype, are transforming the world. And we’re stronger because we stand together. This year we celebrate the 10th anniversary of the Baltics in NATO. A decade ago, skeptics wondered whether your countries were up to the task. And today they need only look at our training exercises where our troops grow even stronger together, shoulder-to-shoulder. They can look at Afghanistan where our forces have sacrificed together to keep us safe and where in just three months the largest operation in NATO history will come to an end, as planned. There is no doubt the Baltics have made our alliance stronger. And your progress reflects a larger truth. Because of the work of generations, because we stood together in a great alliance, because people across this continent have forged a European Union dedicated to cooperation and peace, we’ve made historic progress towards the vision we share — a Europe that is whole and free and at peace. Now, let’s put to rest once and for all the distortions or outdated thinking that has caused this crisis. Our NATO alliance is not aimed against any other nation. We’re an alliance of democracies dedicated to our own collective defense. Countries like Estonia and Latvia and Lithuania are not post-Soviet territory. You’re sovereign and independent nations with a right to make your own decisions. No other nation gets to veto your security decisions. The protests in Ukraine on the Maidan were not led by neo-Nazis of fascists. They were led by ordinary Ukrainians, men and women, young and old who were fed up with a corrupt regime and who wanted to share in the progress and prosperity that they see in the rest of Europe. And they did not engage in an armed seizure of power. Now, these are the facts. They are provable. They’re not subject to dispute. As a result of state-run propaganda, many Russians have become convinced that the actions taken by their government is strengthening Russia. But reaching back to the days of the czars, trying to reclaim lands lost in the 19th century is surely not the way to secure Russia’s greatness in the 21st century. (Applause.) It only shows that unrestrained nationalism is the last refuge of those who cannot or will not deliver real progress and opportunity for their own people at home. Today more NATO aircraft patrol the skies of the Baltics. More American forces are on the ground training and rotating through each of the Baltic states. More NATO ships patrol the Black Sea. Second, and in addition to the measures we’ve already taken, the United States is working to bolster the security of our NATO allies and further increase America’s military presence in Europe. The new initiative I proposed in Warsaw this spring includes several elements, and we’re working with Congress to get it done. Here in the Baltics, it would mean positioning more American equipment, so it’s ready if needed. It would mean more training and exercises between our militaries. And it would mean more U.S. forces, including American boots on the ground, continuously rotating through Estonia and Latvia and Lithuania. Third, NATO forces need the ability to deploy even faster in times of crisis. Now this week our alliance must unite around a new plan to enhance our readiness, and that means we need to step up our defense planning so we’re fully prepared for any threat to any ally. It also means we need to have the infrastructure and facilities that can receive rapid reinforcements, including here in the Baltics. We need to enhance NATO’s rapid response force so it can deploy even more quickly and not just react to threats but also deter them. And even as we meet conventional threats, we need to face other challenges, and that includes propaganda campaigns that try to whip up fears and divide people from one another. We reject the idea that people cannot live and thrive together just because they have different backgrounds or speak a different language. And the best antidotes to such distorted thinking are the values that define us. Not just in the Baltics but throughout Europe, we must acknowledge the inherent dignity and human rights of every person, because our democracies cannot truly succeed until we root out bias and prejudice, both from our institutions and from our hearts. We have to uphold a free press and freedom of speech because in the end lies and misinformation are no match for the truth. We have to embrace open and inclusive societies because our countries are more successful and more prosperous when we welcome the talents of all our people, including minorities. That’s part of the work that we must do. (Applause.) That’s the example we must set. Fourth, even as we keep our countries strong at home, we need to keep our alliance strong for the future. And that means investing in the capabilities, like intelligence and surveillance and reconnaissance and missile defense. And here in Europe, nations need to do more to spur the growth and prosperity that sustains our alliance. To its great credit, Estonia stands out as an ally that contributes its full share — it’s full 2 percent of GDP to the defense of our alliance. And Latvia and Lithuania have pledged to do the same. So this week — (applause). That’s worth applause. (Applause.) So this week’s summit is the moment for every NATO nation to step up and commit to meeting its responsibilities to our alliance. Estonia does it. Every ally must do it. Fifth, we must continue to stand united against Russia’s aggression in Ukraine. (Applause.) Keep in mind that repeatedly President Putin has ignored the opportunity to resolve the crisis in Ukraine diplomatically. The United States, the European Union, our partners around the world have all said we prefer a diplomatic solution. But in light of Russia’s unwillingness to seize that opportunity, we have come together to impose major sanctions on Russia for its actions. And make no mistake, Russia is paying a price. Capital is fleeing. Foreign investment is plummeting because investors know that today’s Russia is a bad bet given its behavior. The Russian economy has slipped into recession. Its energy production, which is the engine of the Russian economy, is expected to drop. Its credit rating is near junk status. The ruble just fell to an all-time low. In short, Russia’s actions in Ukraine are weakening Russia. Russia’s actions are hurting the Russian people. And it doesn’t have to be this way. We have no interest in weakening Russia. It’s a nation with a rich history and a remarkable people. We do not seek out confrontation with Russia. Over the past two decades, the United States has gone to great lengths to welcome Russia into the community of nations and to encourage its economic success. We welcome a Russia that is strong and growing and contributes to international security and peace and that resolves disputes peacefully with diplomacy. And in contrast to Russia’s isolation and economic woes today, that path, which would include a stable and prosperous Ukraine whose sovereignty is respected, would also ultimately result in greater success and opportunity and respect for Russia. That path remains available to Russia. That path will deliver truer progress for the Russian people. But it’s a path that starts by Russia changing course and leaving Ukraine so that Ukrainians can make their own decisions. And I have no doubt that one of their decisions would be to have strong relations with not just Europe, but also with Russia. But it has to be freely chosen. We’ll continue to offer training and assistance to help the Ukrainian military grow stronger as they defend their country. And since ultimately, there is no military solution to this crisis, we will continue to support President Poroshenko’s efforts to achieve peace because like all independent nations, Ukraine must be free to decide its own destiny. And this week NATO must send an unmistakable message in support of Ukraine as well. Our alliance has had a partnership with Ukraine for more than 20 years. Ukrainian forces have served with distinction in NATO operations in the Balkans, in Afghanistan. So in Wales, we’ll meet as an alliance with President Poroshenko to show that our 28 nations are united in support of Ukraine’s sovereignty and right to defend its territory. Now, Ukraine needs more than words. NATO needs to make concrete commitments to help Ukraine modernize and strengthen its security forces. And by the way, we have to do more to help other NATO partners, including Georgia and Moldova, strengthen their defenses as well. (Applause.) And we must reaffirm the principle that has always guided our alliance. For countries that meet our standards and that can make meaningful contributions to allied security, the door to NATO membership will remain open. So this is a moment of testing. The actions of the separatists in Ukraine and Russia evoke dark tactics from Europe’s past that ought to be consigned to a distant history — masked men storming buildings, soldiers without flags slipping across the border, violence sending families fleeing and killing thousands, including nearly 300 innocent men, women and children from all across Europe and around the world when that airliner was shot out of the sky. In the face of violence that seems intractable and suffering that is so senseless, it is easy to grow cynical and I think tempting to give in to the notion that peace and security may be beyond our grasp. But I say to all of you here today, especially the young people, do not give in to that cynicism. Do not lose the idealism and optimism that is the root of all great change. (Applause.) Don’t ever lose the faith that says if we want it, if we are willing to work for it, if we stand together, the future can be different. Tomorrow can be better. After all, the only reason we’re here today in a free and democratic Estonia is because the Estonian people never gave up. You never gave up when the Red Army came in from the east or when the Nazis came in from the West. You never gave up when the Soviets came back or when they sent your best and brightest to the gulag, never to return. You never gave up through a long occupation that tried to break your spirit and crush your culture. Their tanks were no equal to the moral power of your voices united in song. Their walls were no match for the strength of your people united in that unbreakable chain. And like the Poles, and Hungarians, the Czechs, and the Slovaks, and the East Germans on top of that wall, you were stronger and you always believed one day, no matter what, we will win. Today your example, your victory gives hope to people all over the world. Yes, there will be setbacks and there will be frustrations and there will be moments of doubt and moments of despair. The currents of history ebb and flow. But over time, they flow toward freedom – more people in every corner of the earth standing up and reaching to claim those rights that are universal, and that’s why, in the end, our ideals are stronger, and that’s why, in the end, our ideals will win. Dignity will win, because every human being is born equal, with free will and inalienable rights, and any regime or system of government that tries to deny these rights will ultimately fail and countries that uphold them will only grow stronger. Justice will win, because might does not make right. And the only path to lasting peace is when people know that their dignity will be respected and that their rights will be upheld. And citizens, like nations, will never settle for a world where the big are allowed to bully the small. Sooner or later, they fight back. (Applause.) Democracy will win, because a government’s legitimacy can only come from citizens. Because in this age of information and empowerment, people want more control over their lives, not less. And because more than any other form of government ever devised, only democracy, rooted in the sanctity of the individual, can deliver real progress. And freedom will win – not because it’s inevitable, not because it is ordained, but because these basic human yearnings for dignity and justice and democracy do not go away. They can be suppressed, at times they can be silenced, but they burn in every human heart, in a place where no regime can ever reach, a light that no army can ever extinguish. And so long as free peoples summon the confidence and the courage and the will to defend the values that we cherish, then freedom will always be stronger and our ideas will always prevail, no matter what. Thank you, and long live our great alliance. Thank you very much. (Applause.) Thank you. 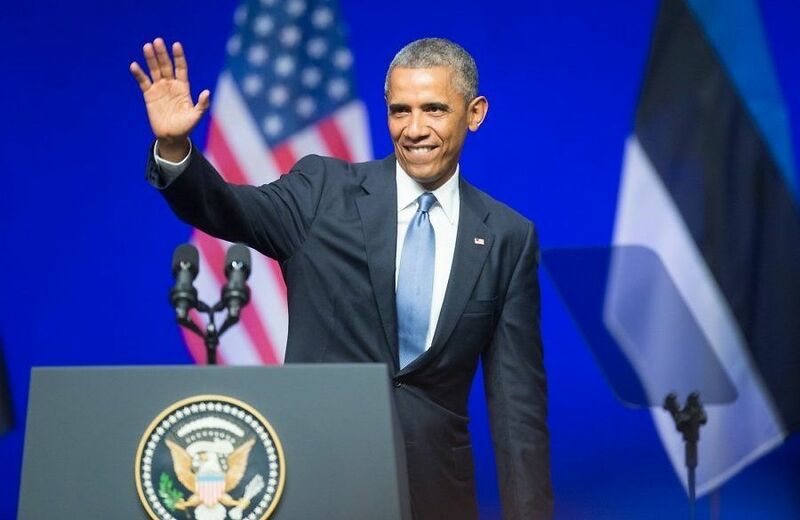 Cover photo: Barack Obama after delivering his speech at Nordea Concert Hall in Tallinn, Estonia on 3 September 2014. Credit: Rauno Volmar/Delfi.